With a fine eye for curation, the Library of America puts out mini collections of authors’ works. These volumes are beautiful books. The latest is Elmore Leonard: Four Later Novels, and this is a must-have for fans of the late writer. 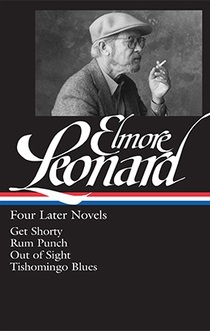 Elmore Leonard: Four Later Novels contains some of the most popular and important works by Leonard, and joins the Library of America’s other volumes on the author: Elmore Leonard: Four Novels of the 1970s and Elmore Leonard: Four Novels of the 1980s. Get Shorty: A Miami loan shark with an idea for a movie finds a way to break into Hollywood as a producer. It is a brilliant satire on the movie industry, which Leonard knew well. Rum Punch: An aging bail bondsman and an airline stewardess matching wits against lawmen and criminals. Out of Sight: Deputy U.S. marshal Karen Sisco and escaped bank robber Jack Foley develop an unlikely romance in the middle of a violent adventure. The Library of America collection also includes the short story “Karen Makes Out,” which introduced Sisco. Tishomingo Blues: Set in Mississippi, this 2002 novel involves exhibition high divers, Civil War reenactors, and an unforgettable cast of gangsters and hustlers. Leonard has been quoted as saying it is one of his favorite novels. Get Shorty starred John Travolta as loan shark Chili Palmer, who discovers the movie business isn’t much different from his occupation. Get Shorty will be filmed again. Epix has announced that Ray Romano and Chris O’Dowd will star in its TV remake of Get Shorty, which will have a ten-episode first season. The show is expected to premiere next summer on Epix. But according to some reports, the characters will have different names. Run Punch was filmed by Quentin Tarantino as Jackie Brown in 1997, with Pam Grier and Robert Forster as the bail bondsman and flight attendant whose attraction to each other fuels the story. I will always remember the scene in which Max Cherry (Forster) falls in love with Jackie Brown (Grier) as she walks out of jail. Out of Sight: It was totally believable that Jennifer Lopez, as Karen Sisco, would fall in love with George Clooney, as the bank robber Jack Foley, in this 1998 film directed by Steven Soderbergh. Tishomingo Blues was to be made into a movie starring—and possibly directed by—actor Don Cheadle. But that project is said to be scrapped. For a bit of trivia, the title comes from the 1917 Spencer Williams song. Elmore Leonard: Four Later Novels was pulled together by Detroit native Gregg Sutter who began working as a researcher for Leonard in 1981. Sutter currently is working on a biography of Leonard. Sutter also is editor of the Library of America’s other editions of Leonard’s novels.